I happened upon this little road after a few miss turns…it was a little winter wonderland. It was so quite, you couldn’t hear car or truck just a few blue jays calling to one another in the distance. I pulled my car over and got out to walk the lane in the snow. Peace. I felt all the days stresses just melt away. It’s times like this that you know someone is watching out over you. 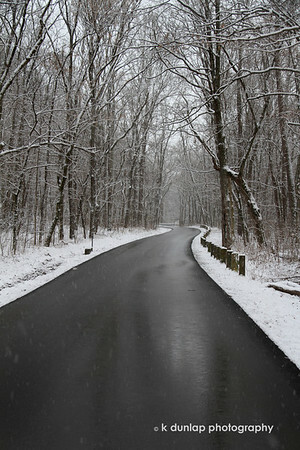 Beautiful winding road and winter scene. Burrrrr - looks like a cool place though. Great shot! Wonderful -- really conveys a sense of calm and tranquility.